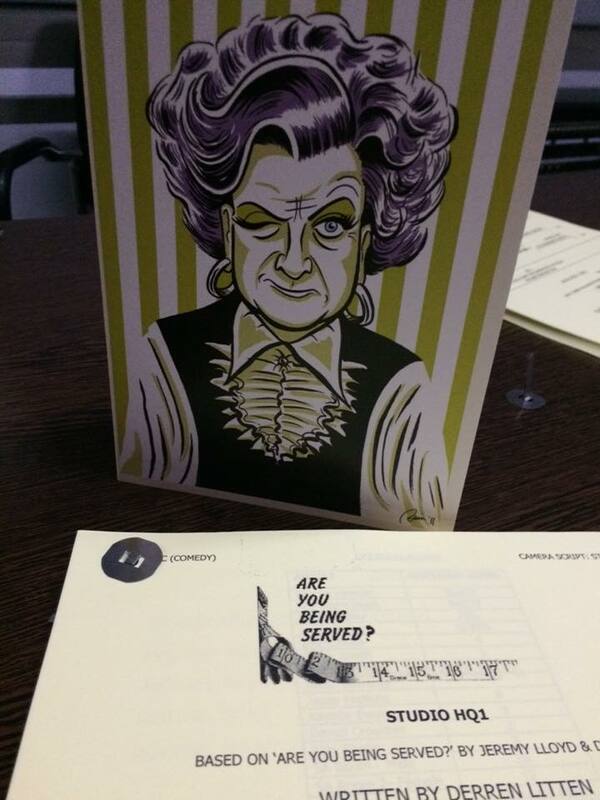 Well, Saturday was the live recording of Are You Being Served. The night was a great success and the feedback from the audience was remarkable. In the audience we were also honoured to have Lizzie Lloyd, wife of the late Jeremy Lloyd who co-write the show, AYBS being based on his days working at the London department store Simpsons in the 1960’s. The cast were so excited to be playing such iconic characters and I must say I was very touched when my dear friend Niky Wardley said she had taken a pair of gloves which Wendy Richard had given her and placed them in one of the Grace Brother’s display cabinets on set. Niky was the person who introduced me to Wendy which how she subsequently appeared in my series Benidorm and then became a friend too. I’ve been asked by the BBC to not give anything away about the AYBS and I can see why that would make sense, it’s much more fun to watch what we have done and then make up your own minds rather than what fans of the show “think” it will be like. On that subject I looked online to find any AYBS forums or groups and this one seemed to be quite active with members regularly contributing (quite astonishing for a show which ended 30 years ago). I read the thread concerning the BBC remake and was astonished to find the vast majority of the fans of the original show totally open minded about the new episode. It gave me much hope in regard to our episode of AYBS, obviously the original cast are no longer with us but our cast play the characters with such affection I can’t see how any true fan could be offended. I think the best compliment we received after the show was from Simon Sheridan, a recognised authority on typical British humour on TV and in cinema. He told me he thought we had done a true continuation of the series, not a tribute or a homage but an actual continuation of the series set in 1988. I really hope that’s the case, I was and still am a huge fan of the original David Croft and Jeremy Lloyd series and I would never want to do anything that disrespected a television classic. Of course a popular question being asked after the studio recording in Manchester was “will the BBC want a new series of Are You Being Served?”, my response to that would be this has been made as a one off episode as part of a season from the BBC celebrating how 60 years ago ‘Hancock’s Half Hour‘ gave birth to the British Sitcom as we know it today. Speculation of any future life of the show would be pointless until after it was shown, and I am unanimous in that! But I do know I had the best time and the greatest fun ever being part of the huge team which put this show together; and who in their right mind wouldn’t want to continue having fun? !